I can’t believe this really happened but I ran out of bananas and forgot to buy new ones yesterday. So this morning I was forced to come up with another recipe for breakfast. Luckily there was some sweetpotato left from yesterday’s dinner. 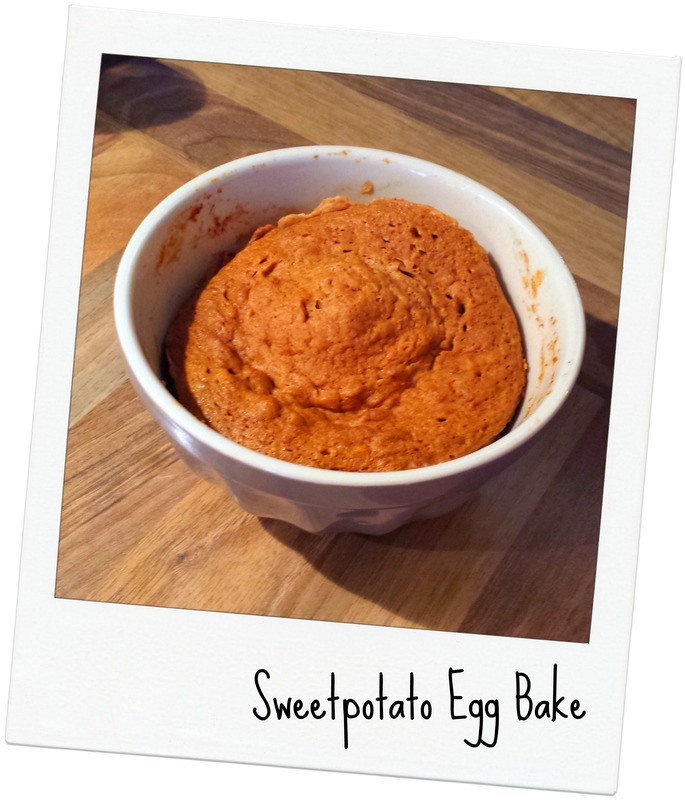 So I just swapped the banana for sweetpotato and voila the idea of Sweetpotato Egg Bake was born. Yummy 🙂 The consistency and base tasted a bit like Gingerbread! I will definitely making this again in fall and add some gingerbread spices. Those two songs are currently on my mind all the time. Which songs are stuck in your head currently? I am meeting my close and long (elementary school) friend Dani now for a cup of coffee and later I am going to the hair dresser’s. Hope you have a lovely day my dear friends! Oh Narnia. Stop teasing us. 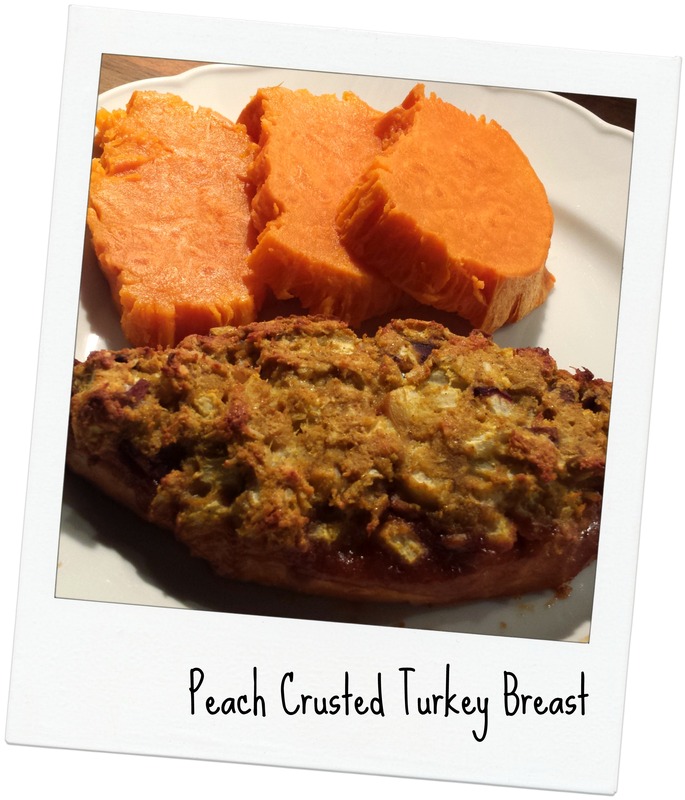 And that recipe- Never thought to combine peaches with turkey! Yum! travel pet peeves….don’t even get me started. Noisy kids, BABIES, having a middle seat, the smell of bad airplane food. No wonder people hate coming to Australia. The flight in itself is off putting. I forgot about the kids :-/ And then my friend told me yesterday he was sitting next to a puking guy on a 10h flight. HORROR!!! Is it crazy that I’m already looking forward to fall so that I can start busting out all things sweet potato, pumpkin, and squash? I love summer, but it’s getting to the point where I”m getting tired of it and would like to see some cooler weather. Ask me in 4 months, and I’ll probably be cursing winter though 😆 As for songs stuck in my head… Black Widow by Iggy Azalea. I’ve had that song on repeat for way too long now. I know what you mean. I have already thought about making a gingerbread mugcake the other day… but then in fall I will dream of fresh berries again! Take a deep breath and remember to relax because the travel is going to go completely fine and you’re going to have the time of your life. You’re so right. I would give the same advice to anybody else. But as always: Medice, cura te ipsum.